The Toshiba hard drive and Toshiba laptop hard drives are manufactured by Toshiba’s Storage Device Division. This division has offices in the United States, Germany, Taiwan, Shanghai, and Tokyo, and employs close to 15,000 people worldwide. Toshiba’s history is quite long. The company was created in 1875. Its hard disk division goes back many years as well, but not as far back as that. The HDD area started in 1967 with the production of a 14 inch hard disk drive. Since then Toshiba has been progressing in the hard disk drive market and is one of the top five hard drive manufacturers. Other past highlights include: the shipping of the first HDD using glass as the disk base (a 2.5 inch hard drive) in 1990; the introduction of the first 1.8 inch hard disk drive in 2000; development of the world’s smallest hard disk drive (0.85 inches) and was recognized for this by an entry in the Guinness Book of World Records in 2004; and the acquisition of Matsushita’s hard disk drive division that was based in the United States in 2005. Other highlights include the introduction of portable USB Toshiba external hard drives in 2007 and launch of the highest capacity 2.5 HDD (400GB) in 2008. In 2009, Toshiba was able to acquire the hard disk drive division of Fujitsu, a company with a long history in the hard disk drive market as well. Toshiba’s portable external hard drives range from 250 to 640 GB and carry a 3 year limited warranty. Their Enterprise hard disk drive products for servers, storage arrays, RAID systems, and digital video systems come in a variety of different capacities and in 2.5 inch or 3.5 inch disk sizes. 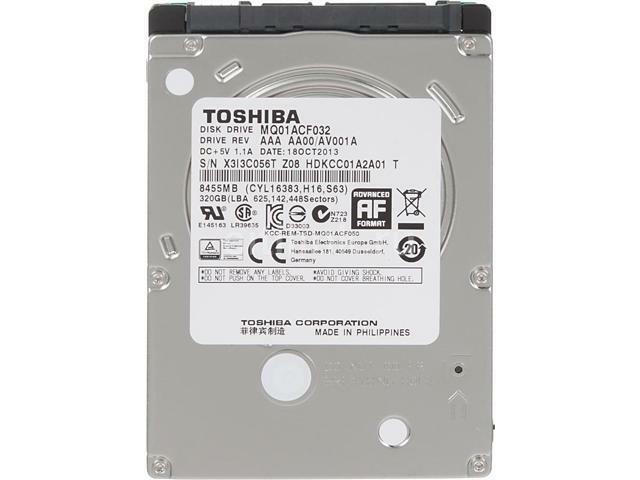 Toshiba laptop hard drives and Toshiba PC or desktop hard drives are also available. There are many options for these latter hard drive categories. The hard disks are either 1.8 inches or 2.5 inches in size and capacities range from a low of 40 GB to a current high (as of 2010) of 640 GB. In addition to Toshiba hard drives and Toshiba laptop hard drives, this company offers other storage options such as optical disk drives, solid state drives, and NAND flash memories. More information on Toshiba hard disk drives can be found at the Toshiba website.